With this Discovery Table what's on top stays on top, thanks to a 3" lip all the way around the surface of the table. 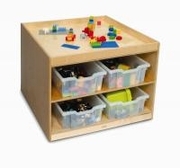 When it's time to pick up the toys and books can be stored away underneath on either side on shelves or in storage trays (trays are sold separately). Ships fully assembled by truck. Made in the USA. Greenguard Certified. Dimensions: 31.5in. × 31.5in. × 24in.